Efforts by Godswill Akpabio, former Senate Minority Leader, to become leader of the All Progressives Congress (APC) in Akwa Ibom State has been rebuffed by the party’s stakeholders in the state, Daily Independent has reliably learnt. Akpabio recently defected from the opposition Peoples Democratic Party (PDP) to the governing APC. Rising from a meeting on Monday, members of the state working committee and other stakeholders turned down Akpabio’s overtures as they insisted that the state caucus chairman of the party, Atuekong Don Etiebiet, should continue as leader of the party in the state. Etiebiet was a Minister of Petroleum as well as National Chairman of the defunct ANPP. Present at the meeting were Senator John Udoedehe, Group Captain Sam Enwang (rtd), Obong Nsima Ekere, Mr. Umana Umana, Obong Rita Akpan, and others. At the meeting held in Uyo, on August 25, the APC chieftains and stakeholders resolved that Don Etiebet should continue as leader of the party in Akwa Ibom State. It was gathered that the refusal of APC stakeholders to allow Akpabio emerge as their leader was not unconnected with the National Chairman of APC, Comrade Adams Oshiomhole’s pronouncement of the former governor as leader of the party in Akwa Ibom during his reception into the party on August 8 in Ikot Ekpene. Akpabio’s plea to have an alternate chairmanship position created for him was vehemently opposed by the stakeholders. Specifically, Enwang, in opposing Akpabio’s ambition, contended that it was not part of the party constitution. However, after Akpabio’s plea to be made an alternate chairman of caucus was roundly resisted by the stakeholders, notably Senator Aloysius Etok and former military governor of Ogun State, Group Captain Sam Enwang, a source said, the senator promised to abide by the decision of the stakeholders. The decision to retain Etiebet as leader of the party over Senator Akpabio was part of a six-point resolution adopted at the stakeholders’ meeting. A caucus member of the party told reporters that many stakeholders would have left the party if Akpabio had insisted on leading the party in the state. He said the resolution was a saving strategy to forestall more defections from the party to the PDP, stressing that Akpabio’s real motives for joining the APC were yet to be known. 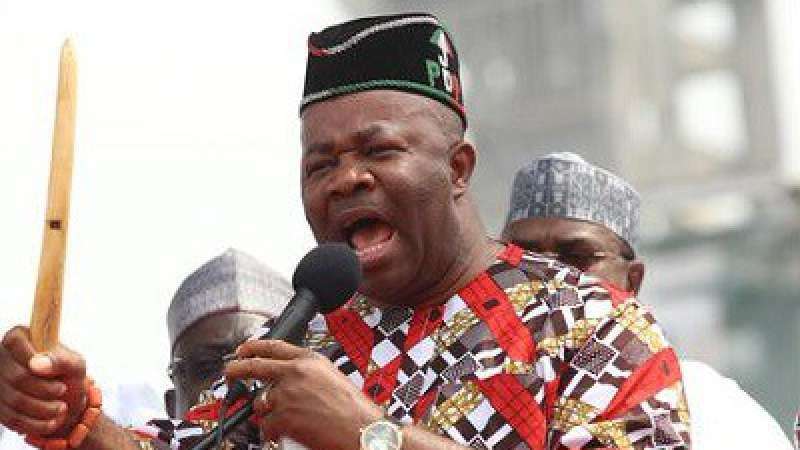 Since Akpabio joined the APC, some stakeholders – including a former governorship aspirant, Dr. Udoma Bob Ekarika; the immediate past state deputy chairman of the APC, Obong Emmanuel Udoh, and youth leaders of the party from Ikot Ekpene Senatorial District had defected to the PDP.